Whenever traveling to other cities, food is generally a main focus when planning the trip. One thing I like to do is look up where Adam Richman from Travel Channel’s “Man vs. Food” has been. While I have little interest in the challenges themselves, I find that many times the food that the challenges are based on look really interesting, delicious, and often unique. One such place exists in Lakewood, OH, where a recent trip to visit family brought me to the area. Melt Bar & Grilled is TripAdvisor’s #3 out of 113 restaurants in Lakewood, which was the original of five locations to eventually open. 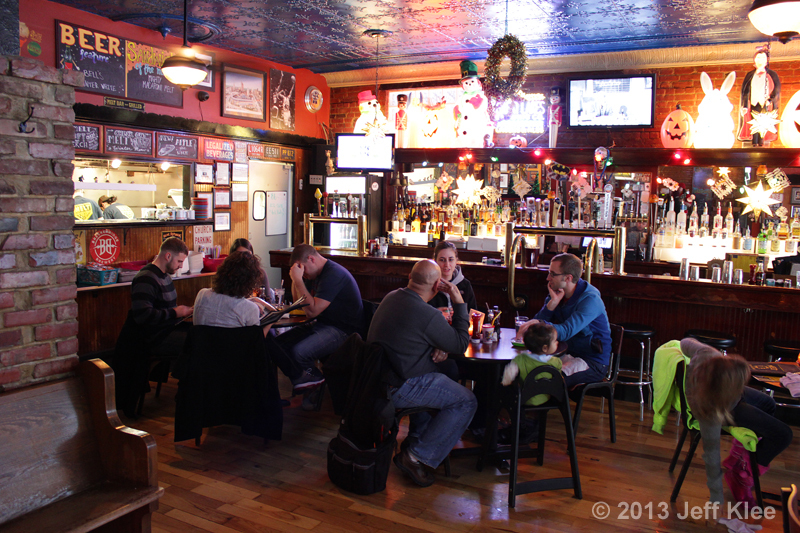 Melt is a very popular place in the Cleveland area, and many patrons are known to wait over two hours for a table. Based on the reviews, an hour or longer wait is not uncommon on most days. Maybe we were lucky, but my wife had taken me here once before, and both times we showed up as they opened and got seated immediately. 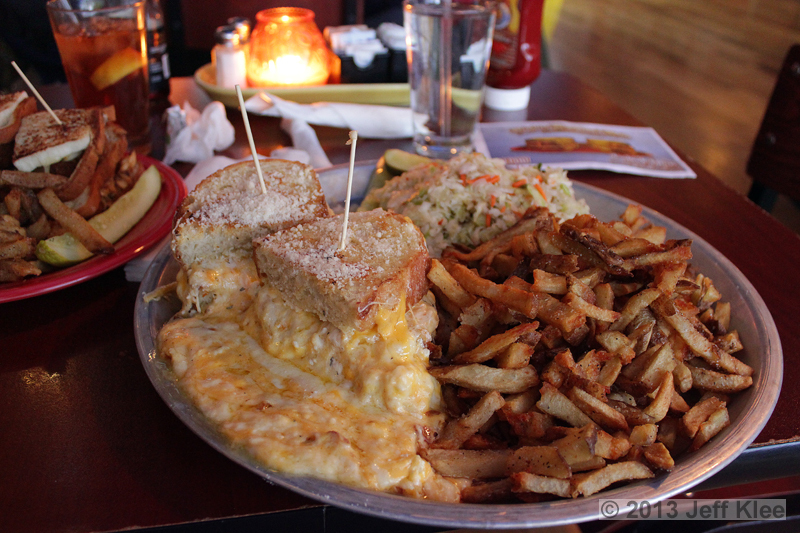 I’ll offer a quick overview of Melt’s Lakewood location before showcasing my meal. 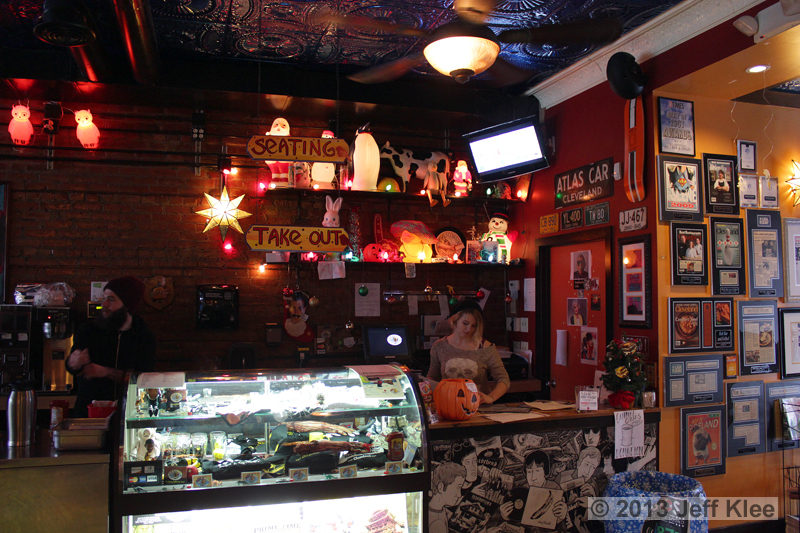 The restaurant’s entrance puts you into a small waiting area that connects the side with table seating from where this photo was taken, and the bar area to the right of the photo. Opposite that wooden bench is a counter where customers can check in to be seated, purchase merchandise, or pick up to-go orders. The bar area includes several tables across the middle of the room. 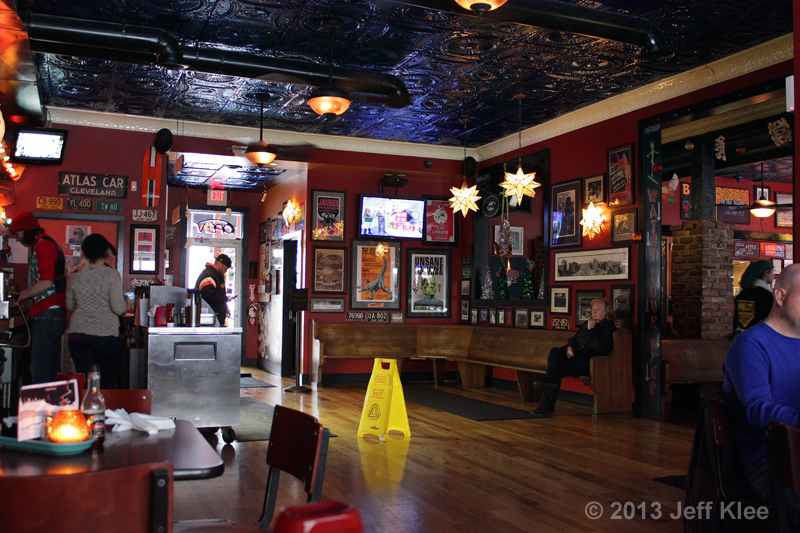 Since we arrived as they opened at 11:00 am, the bar was still empty, along with most of the tables. 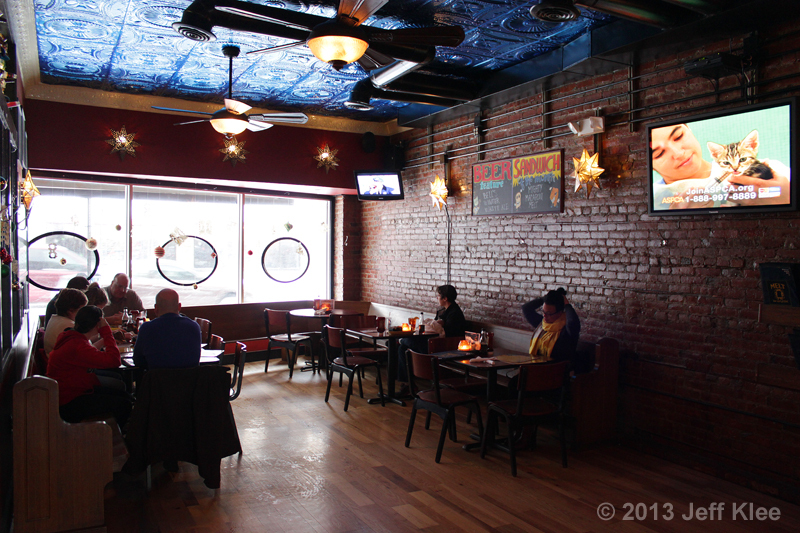 On the other side of the restaurant is an equally sized room with a few tables for dining. Overall, the entire restaurant has a bar feel to it. Lighting is kept low, televisions on the walls play sporting events, and other than the brick wall seen below, the others are covered in posters, photographs, signs, and other decorations. This is the room where we were seated, and I was ready to order my super-sized meal. On a future visit I’ll showcase more of the menu and other sandwiches available, but today it was all about the Melt Challenge. 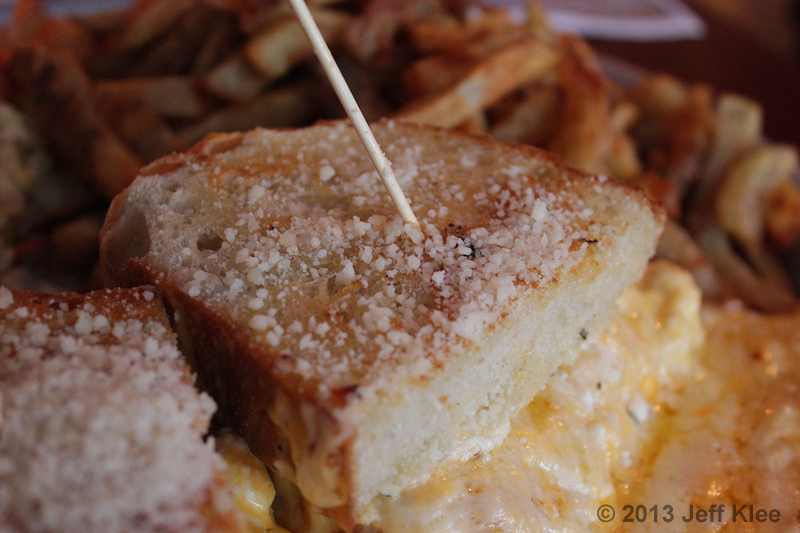 The Melt Bar & Grill’s primary focus is grilled cheese sandwiches. While they offer salads and burgers as well, most people flock here for the sandwiches. Their grilled cheeses are not the standard little triangle cut slices you had as a child. They are big enough, that when combined with a side, it’s usually enough food to even satisfy my appetite. 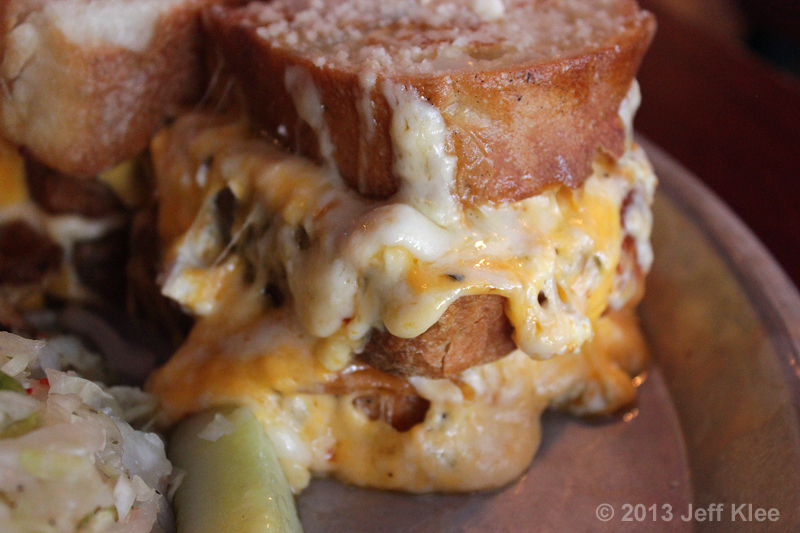 The Melt Challenge builds off these already giant sandwiches, and takes it to the extreme. To begin, the Melt Challenge is served on a 14” pizza pan. Here’s the giant pile of food that was placed in front of me at the table. This silver platter is served with over 5 pounds of food. 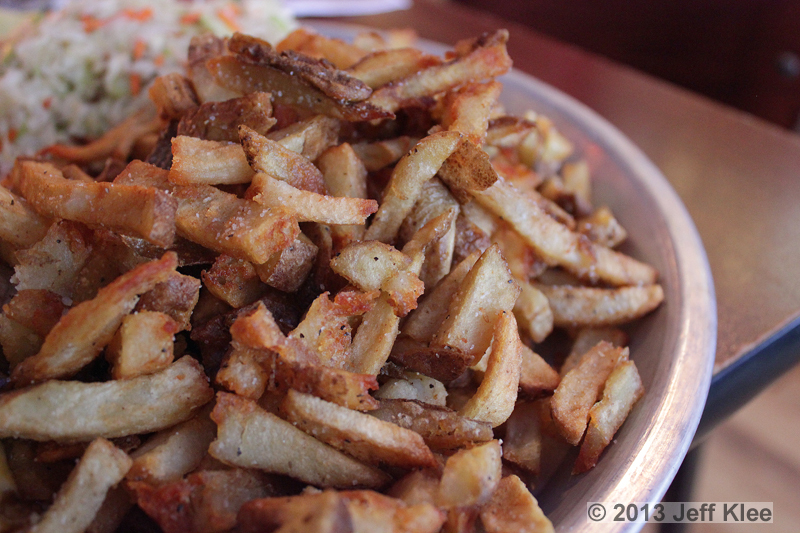 The pile of fries and slaw weigh in at half a pound each. The challenge is to finish all 5+ pounds of food without any help or trips to the bathroom. If you do this successfully (no time limit), you get either a Melt branded t-shirt or pint glass, a $10 gift card, and your photo on their Melt Challenge Hall of Fame. I don’t know if the Hall of Fame is physically in the restaurant, but I know you can find it on their website. After eating half of my sandwich, I decided to compare my plate with my wife’s. Seeing the pizza pan next to a normal dinner plate, the smaller plate is dwarfed. My focus was on the sandwich. I never had any intention of actually doing the challenge. I planned on ordering it just for the grilled cheese sandwich. 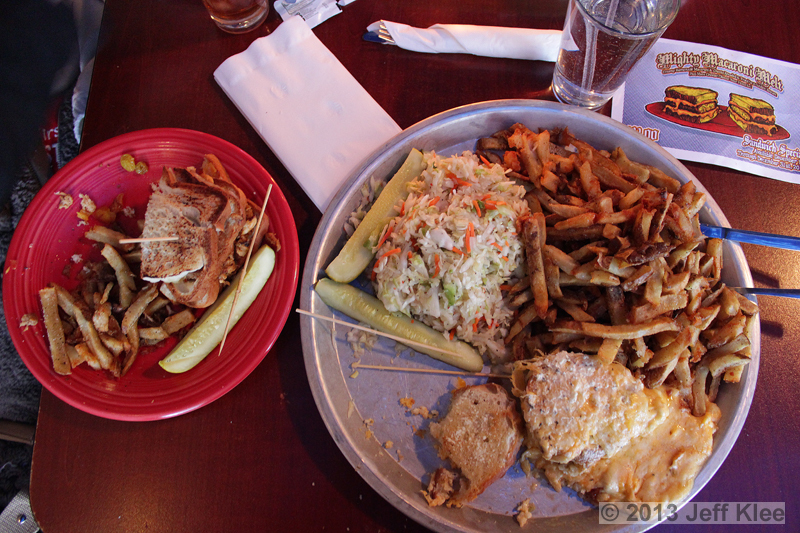 You can’t order this particular sandwich on the regular menu, so I had no choice but to order the whole challenge plate. I let the server know up front that he didn’t have to keep watch on me as I wasn’t planning on finishing everything, and also wasn’t planning on following the rules, as I knew I’d have to let my wife try a bite. This sandwich was literally overflowing with cheese. It comes with nearly three and a half pounds of the gooey stuff. Now I’m a serious lover. As a kid growing up, a normal snack for me often consisted of one of those 8 ounce bricks of sharp cheddar, so I’m not afraid of a sandwich that’s practically all cheese. But this was seven of those childhood snacks. There were probably two of those bricks just pooled up on the pizza pan, never mind what had actually stayed in between the slices of bread. 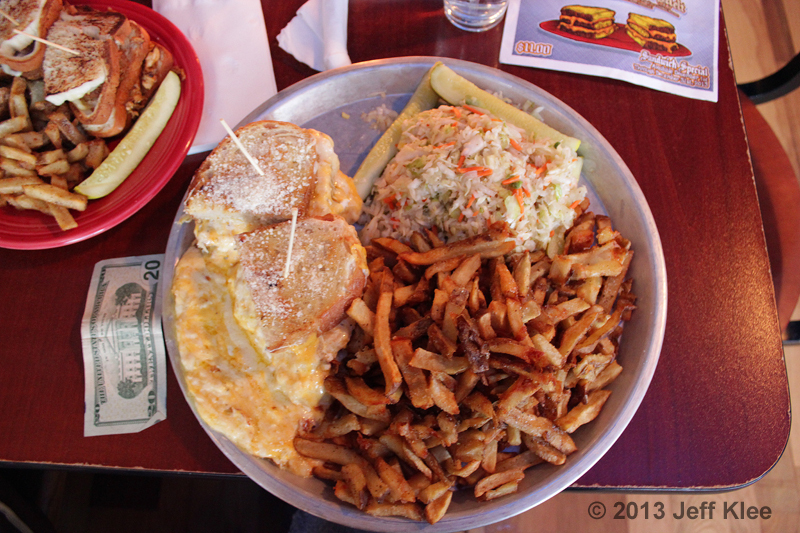 Speaking of the bread, the Melt Challenge includes three very thick-cut slices of bread, which like any grilled cheese sandwich, are thoroughly buttered and then grilled. 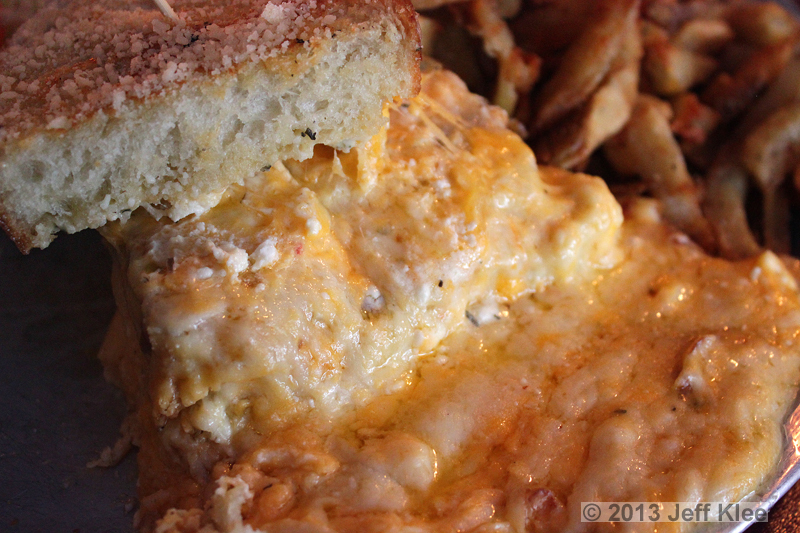 The bread was topped with a Parmesan cheese. Of all the cheese included here, the Parmesan was one of the ones I could pick out easily. The bread was grilled just to the point where the edges were crispy, but the middle was still soft enough to make the sandwich easily cut (you didn’t think I ate this with my hands, did you?) and chewed. The Parmesan, with its slightly firmer texture was in a great place. Sitting on the firmer bread, it didn’t get pushed in and lost, and what was probably the saltiest of the cheeses, stayed on the outside where the flavor was easily noticeable. Parmesan just makes a perfect “topper” cheese. So what other cheeses were included in this sandwich? Yes, you read that correctly. The four pound sandwich included the already mentioned Parmesan, plus cream cheese, cheddar, Gouda, goat, Swiss, bleu, feta, provolone, cheddar-jack, muenster, American, and pepper jack. I think our server explained in one perfect phrase what my opinion would be of this sandwich. He said, “at first this will be the best grilled cheese sandwich you’ve ever had. By the end, it’ll be the most disgusting thing ever.” I don’t know about you, but I can relate to the general idea behind this. Cheese is an awesome flavor, but when you’ve had too much, it can be one of those flavors that really goes downhill fast. Well, that’s exactly what happened during this meal. 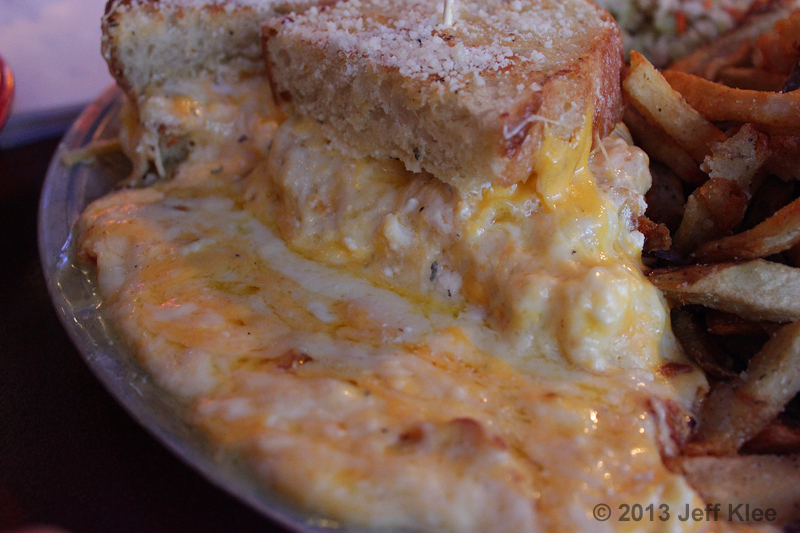 The Melt Challenge grilled cheese sandwich overall was quite incredible. Each bite had so many different flavors of cheese, it was quite the sensation. I couldn’t pinpoint each one, but I distinctly noticed the Parmesan on top, and inside, the goat and bleu cheeses were the standout flavors. The cream cheese helped compose even more creaminess to the already flowing melted cheeses. The bulk of the sandwich was largely smooth and creamy, but many bites also had the stand-out crunch of the grilled bread. As I got about three quarters of the way through my sandwich, my server’s prediction was beginning to come true. I wasn’t getting full, but I was starting to get sick of the taste of cheese. I eventually got it all down, minus a bite or two that my wife had, but it actually got pretty gross by the end. Let me put this out there in case you weren’t clear… three and a half pounds of cheese is a lot. After I finished the sandwich I wanted to give the french fries a try. Remembering my last visit, their hand-cut fries were pretty good, and these weren’t too bad either. There was nothing spectacular about them, and in fact I found them a little undercooked for my tastes, although some of the sogginess could have been from them sitting for some time on my “plate.” On the positive side, they were well salted, and there were plenty of them! Truthfully, it was tough to give an honest opinion after having just finished a four pound cheese sandwich, but I have to admit that I nibbled on them while waiting on our server to bring the check and take payment. 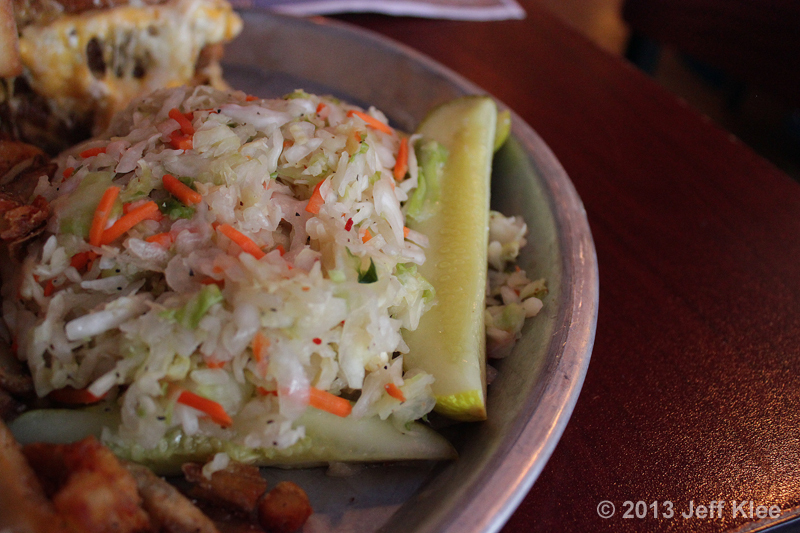 Their vinegar-based coleslaw is homemade, and I also had been served a nice half pound of this side, along with a couple pickle spears. I didn’t touch the coleslaw for a couple reasons. First, I don’t really like coleslaw all that much, and also because any room I had left in my stomach was going to be filled with fries. I definitely felt that this challenge item was worth the $ purchase price. I knew I would never finish the whole platter of food, but that’s not what I was here for. I just wanted to try a thirteen cheese sandwich, that had been perfectly grilled until the outside was crisp, and the inside soft and melted. It was rare experience for grilled cheese sandwiches. Even though I was sick of it by the end, it was still an amazing meal, and I could actually see myself getting another one in the future. Unfortunately (or fortunately), they have so many other amazing grilled cheese sandwiches, it could be a while before I get through the others and make my way back to the Melt Challenge.